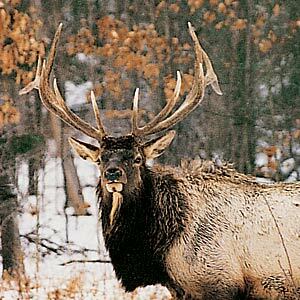 Did you know there's an elk herd in northwest Pennsylvania? It's true — from 1913 to 1926, state officials brought in 177 elk from Yellowstone National Park to replace native elk wiped out by hunting. Today, an estimated 550 elk roam freely around Benezett in Elk County. In fact, it's not unusual to encounter them just a few steps outside our house on Winslow Hill, a popular viewing area. You can see the elk in any season; the best times are during early mornings and evenings. Most tourists visit during the rutting season from August through October, which coincides with the fall foliage displays. I'd recommend a stop at the Benezett Store on State Highway 555 (1-814-787-7456); the folks who run it keep tabs on the elk herd and can steer you in the right direction. Benezett is on Highway 555, roughly 32 miles northeast of Du Bois (located on I-80). From I-80, drive north for about 18 miles on State Highway 255 (Exit 101) to Weedville, then head east for about 10 miles on Highway 555 to Benezett. From the Benezett Hotel, follow the elk viewing signs to the Winslow Hill overlook. To learn more call the Northwest Pennsylvania's Great Outdoors Visitors Bureau at 1-800-348-9393 or check out www.pagreatoutdoors.com, then click on “Destinations” and “St. Marys Area”. To find out about more area attractions, call the St. Marys Chamber of Commerce at 1-814-781-3804 or log on to www.stmaryschamber.org.